This reception bench is the perfect piece to provide additional seating right next to a wall or window in your waiting room. 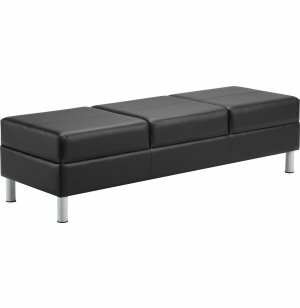 CITI Reception Furniture by Global creates a stylish, sophisticated waiting room for office visitors. 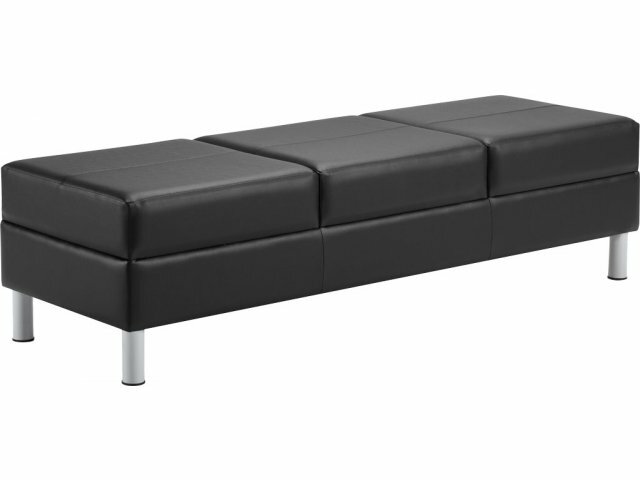 Contemporary furnishings are space efficient, with finely scaled proportions and boxy contours. Raised metal tubular legs allow easy cleaning access and enhance the reception area with an airy, light feel. High cushions and firm padding ensure supportive, first-class seating, and coordinating cube-shaped end table adds functional chic. With double, needle-stitched seams and a solid construction, CITI reception area furniture presents top quality, comfort and fashion at an affordable price. Space Saving: Scaled to fit comfortably in any size room. Stylish: Streamlined, fashionable design is well-suited for contemporary office settings. Comfortable: The leather/mock-leather combination upholstery is soft, breathable and easy to maintain. Practical: Metal tubular legs are raised, to clear the way for easy cleaning access. Supportive: Firm cushion padding and high backs provide comfortable seating. Durable Construction: Fixed, top-stitched cushions, double needle-stitched seams, and a quality, solid frame will withstand tough use.